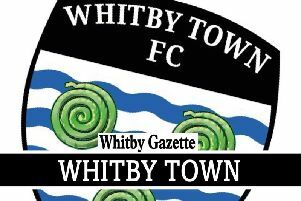 Whitby Town return to action on Saturday when they host fellow strugglers Grantham. With European Championship qualifiers meaning no games in the Premier League and Championship this weekend, supporters who normally follow senior sides in the area are urged to back the Blues at the Turnbull Ground instead. The Seasiders host Grantham at 3pm with families encouraged as under-16s are admitted free with a full price paying adult (£9), under-18s pay just £3 and senior citizens £5. Like Whitby, Saturday’s visitors are languishing in the bottom four and have yet to win away this season, losing 3-0 at home to Buxton on Tuesday night. The Gingerbreads lost out 2-1 in the corresponding clash, last October- Dave McTiernan and Matty Waters on target for the Blues - and then 1-0 in the return when McTiernan struck, earlier this year. The Seasiders have an impressive overall record against their Lincolnshire rivals with six wins and just one defeat from eight previous meetings. Boss Darren Williams is expecting a reaction from his players after a poor second-half showing saw them beaten 3-1 at Workington on Tuesday evening. “I think we’re a better footballing side than Workington, but they worked harder than us in midweek, and that’s inexcusable,” he said. “I’ve told the lads that they if they aren’t prepared to put the hard work in and graft on the pitch then they may as well not bother turning up. “I can’t make any excuses about us tiring in the second half or about the late arrival at the ground being to blame. Whitby are then at home again on Wednesday night with a 7.45pm kick-off as former Conference club Hyde United visit the Turnbull Ground. The Tameside club have suffered back-to-back relegations and lie 16th going into the weekend programme, despite defeating title-chasing Darlington away twice (once in the FA Cup). The shot-shy Tigers have netted just 19 times this term, but conceded only 20.